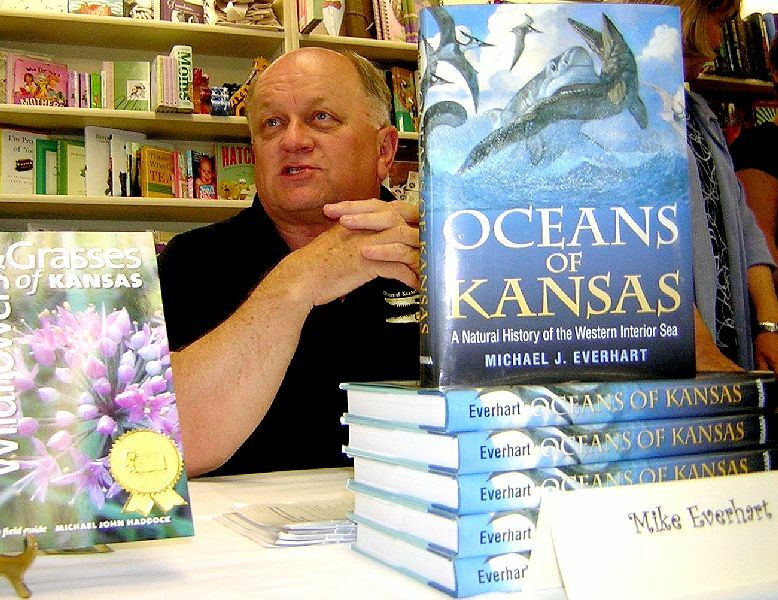 "A journey to a time when sea monsters roamed the middle of America"
Oceans of Kansas was named the featured book from Kansas for the 2006 National Book Festival in Washington, D.C. It was also a featured book of the Discovery Channel Book Club and is currently in its 3rd Printing by the Indiana University Press... over 6000 copies sold! 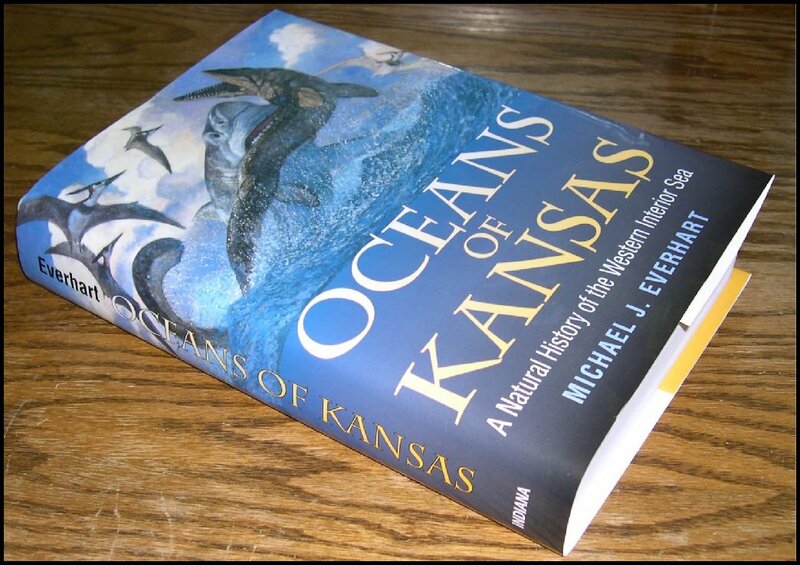 Almost since creating the Oceans of Kansas Paleontology website in December, 1996, visitors have been asking me where they could buy the book. For years I had to tell them there was no book. However, the fact that visitors kept asking about the "book" was one of factors that helped me to decide that I should write something about the prehistoric oceans of Kansas. Fortunately, the editors at the Indiana University Press agreed that it was a good idea and offered me a contract for the book in late 2001. It took a year longer to write than I had planned, but that year was spent uncovering more fossils and more information about the history of fossil discoveries in Kansas, and the Midwest. The manuscript for the book was "finished" in the spring of 2004... and then I began to learn about the process of actually getting it ready for publication. The text was sent to various reviewers and professional editors, some of whom knew nothing about fossils, but a lot more about writing and the English language than I did. Although most of the manuscript was acceptable, I revised other sections, corrected errors and then actually added the final chapter at the urging of my editor (James Farlow) after I thought I was "all done." The review process greatly improved the book's content and readability. Once the words were in place, a 'blue line' galley proof was printed with page numbers and I spent ten solid days going through the 265 pages of text to create a comprehensive index. 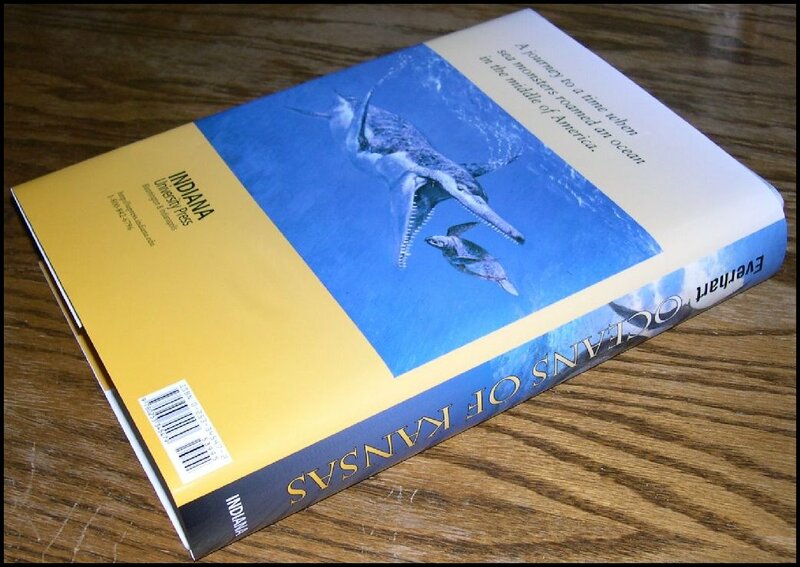 Although the book itself is technically 265 pages, the final volume including the literature cited and index is 321, not counting the 8 page color insert (7 pages of which are beautiful paintings by paleoartist Dan Varner). At that point, my work on the book was complete. It went to press later in the spring of 2005. As a surprise to everyone, editors and the author alike, the book sold 1700 copies of the original order of 2500 BEFORE it was released in June. It then went into a second printing about two months later. I'd like to think it was mostly as a result of what my viewers could see on the OOK web site. The book was also chosen by the Discovery Channel Book Club as one of their featured selections in 2005. All totaled, the book has sold more than 7000 copies to date ... no threat to "Harry Potter" or Tom Clancy, but a solid, respectable number for a science book, especially one limited to a relatively small slice of paleontology. After it was released, it was named as the featured book from Kansas at the 2006 National Book Festival in Washington, D.C. It was also chosen by the Governor of Kansas as one of the books to be given from the state to the ships library on the newly commissioned USS George H.W. Bush nuclear aircraft carrier (2008). The best thing is that it is finished, and when people ask me about the "book", I can actually tell them where to find one. Thank all of you for your support over the years! !